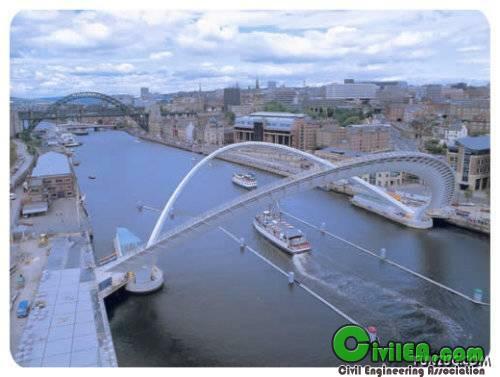 Designed by Wilkinson Eyre Architects and engineered by Gifford, the bridge takes its place at the end of a line of distinguished bridges across the River Tyne, including the Tyne Bridge and Robert Stephenson's High Level Bridge. Linking Gateshead with Newcastle via Gateshead Quays (described as one of the best places in Europe by Tony Blair) and Newcastleâ?™s Quayside, the bridge not only serves a functional purpose as the River Tyneâ?™s only foot and cycle bridge, but its grace and engineering attract people from all over the world. 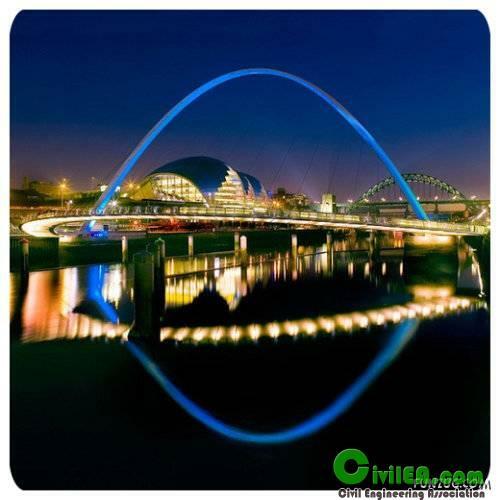 In 1996 Gateshead Council launched a competition to find a bridge that would link developments on both sides of the River Tyne and also complement the existing six bridges crossing the river. There were over 150 entries. Gateshead residents voted for their favourite design from a shortlist of leading architectural companies. The winning design by Wilkinson & Eyre Architects and Gifford & Partners met the criteria perfectly. Everyone knew this design was exceptional. 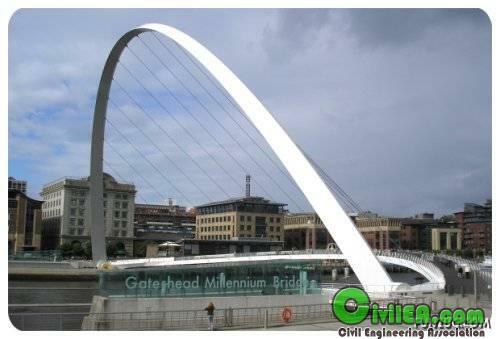 "When we chose the design for the Gateshead Millennium Bridge, we knew we had something very special. The many awards and accolades it has received for its design and construction, has certainly proved us right. 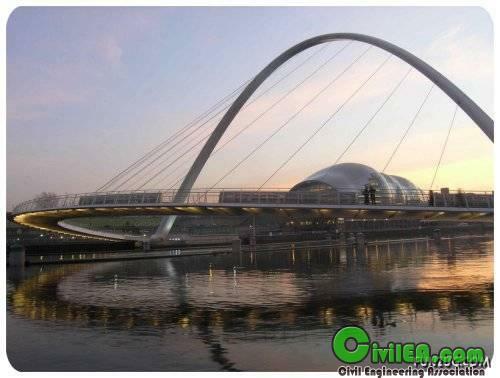 But even though we knew how innovative it was, we have been taken aback by the massive worldwide interest in our bridge. "Local people have taken the bridge to their hearts as a symbol of Gatesheadâ?™s renaissance, and we are thrilled that the bridge now looks set to appear on a pound coin in the near future. "But we are equally flattered that people right around the world are interested in what we have done, and will continue to do, in order to regenerate Gateshead Quays and East Gateshead." The Lupu Bridge is currently the longest arch bridge in the world, stretching a massive 550 meters across the Huangpu River, China. Along with being a record holder ("The bridge's arch is longer than the previous record holder, the 518-metre long New River Gorge Bridge in West Virginia"), the bridge is also the center point for a lot of local hostility. The need for a bridging between the Luwan District on the north bank, and Pudong New District on the south bank was agreed by all, but that was where the agreement stopped. 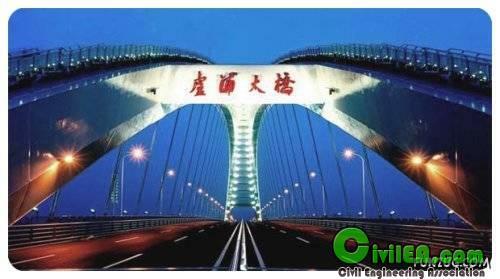 The exorbitant cost of the Lupu Bridge was frowned upon by locals and scholars, but chosen by the disgraced mayor Chen Liangyu as it would set the area apart with a world record bridge. The critics use this bridge as an argument to prove the city officials superficiality, when weighed against the needs of its people. 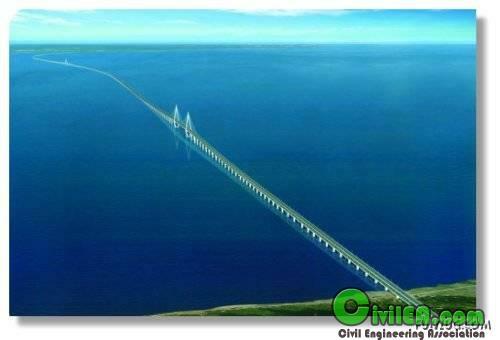 Hangzhou Bay Bridge , is a cable-stayed bridge across Hangzhou Bay off the eastern coast of China. It was linked up on June 14, 2007, and connects the municipalities of Shanghai and Ningbo in Zhejiang province. The bridge is the longest trans-oceanic bridge in the world, although it does not have the longest cable-stayed main span. 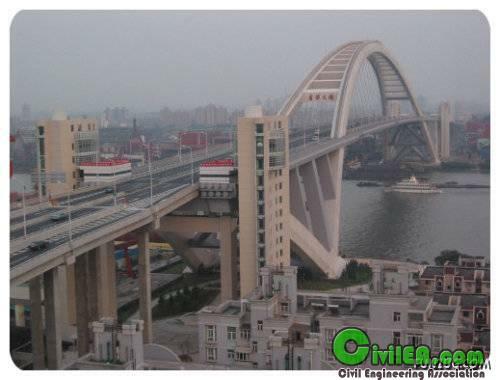 The opening ceremony was held on June 26, 2007 with great domestic media publicity, though after the opening ceremony, the bridge would only be used for test and evaluation purposes. It will not be available to ordinary public transportation, which is scheduled sometime in 2008. 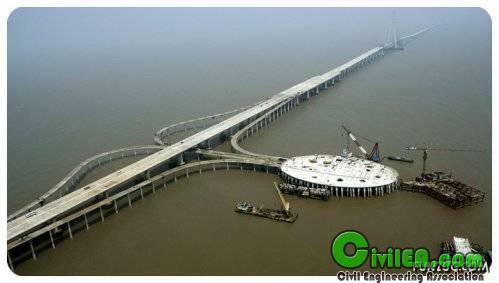 Construction of this bridge started on June 8, 2003. The bridge itself is 36 km long with six expressway lanes in two directions, making it the second-longest bridge in the world after the Lake Pontchartrain Causeway in Louisiana, USA. The bridge has two main spans, with a 448 metre northern span, and a 318 metre southern span. The designated speed is 100 kilometers per hour, and the designed longevity is more than 100 years. 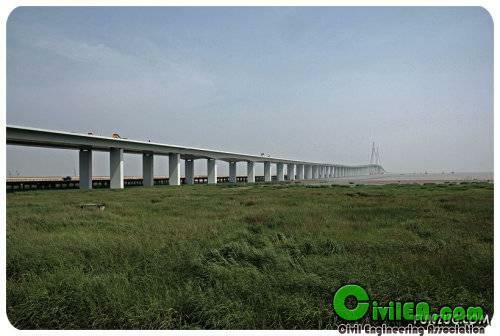 The total investment on the bridge is RMB 11.8 billion (US$ 1.4 billion as of December 2004). 35% of this amount was raised from private companies in Ningbo, 59% was provided as loans from China's central and regional banks. Orthotropic steel deck is used on its main spans and five ramp bridges, and is to be paved with 50 mm epoxy asphalt concrete. Many innovations seem only to appear where there is a really unusual need, warranting an unusual solution. 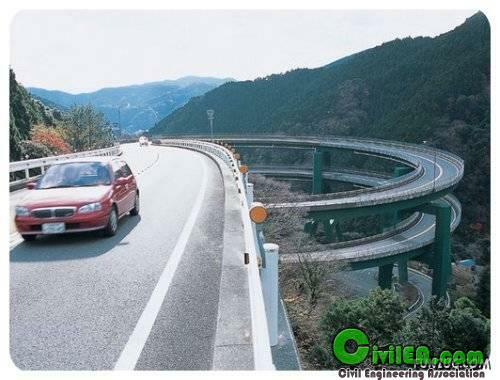 The Kawazu-Nanadaru Loop Bridge in Japan is one such example: How do you build a bridge from one mountainside to another when the sides of the mountain are so steep that it is not possible to build a road at the same elevation on both sides? This double spiral brings cars up and down a full 45 meters (148 feet) while being seemingly suspended in a valley between two mountainsides. Coming upon this bridge in the middle of this mountain road is quite an experience. The bridge was finished in 1982 and has become a popular landmark on route 414 heading south from Tokyo towards the hot spring resorts of the Izu peninsula. 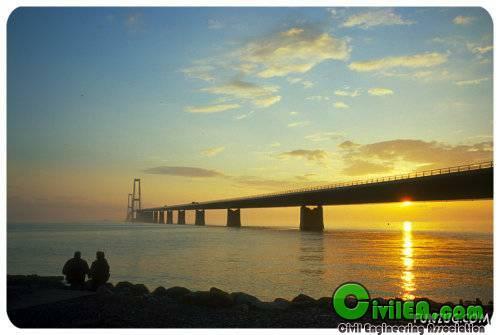 The Oresund Bridge (Danish Ã˜resundsbroen, Swedish Ã–resundsbron, joint hybrid name Ã˜resundsbron) is a combined two-track rail and four-lane road bridge across the Oresund strait. 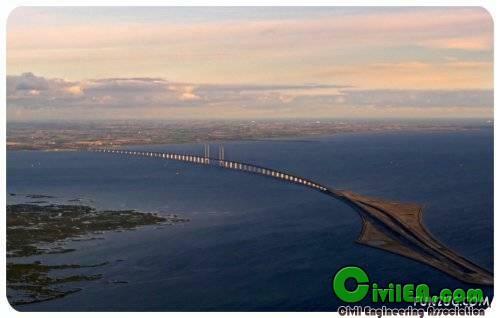 The bridge-tunnel is the longest combined road and rail bridge in Europe and connects the two metropolitan areas of the Oresund Region: the Danish capital of Copenhagen and the Swedish city of MalmÃ¶. The international European route E20 runs across the bridge, as does the Oresund Railway Line. The bridge has one of the longest cable-stayed main spans in the world at 490 metres (1,608 ft). The height of the highest pillar is 204 metres (669 ft). The total length of the bridge is 7,845 metres (25,738 ft), which is approximately half the distance between the Swedish and Danish landmasses, and its weight is 82,000 metric tons. The rest of the distance is spanned by the artificial island Peberholm (Pepper islet) (4,055 m), named as a counterpart to the already existing Saltholm islet, followed by a tunnel on the Danish side. The tunnel is 4,050 metres (13,287 ft) long, a 3,510 metre long buried undersea tunnel plus two 270-metre gate-tunnels. On the bridge, the two rail-tracks are beneath the four road lanes. The bridge has a vertical clearance of 57 metres (187 ft), although most boat traffic across Oresund still passes over the Drogden strait (where the tunnel lies). The bridge was designed by Arup. 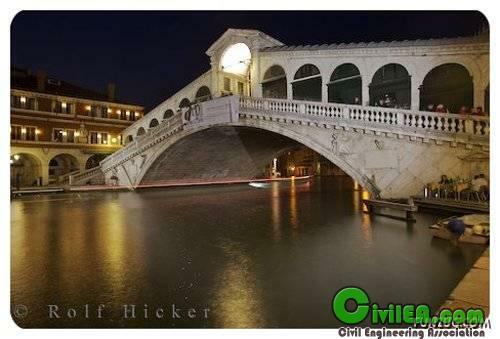 The Piazza di San Marco may be more famous, but the Ponte di Rialto (Rialto Bridge) is the true heart of Venice. The current structure was built in just three years, between 1588 and 1591, as a permanent replacement for the boat bridge and three wooden bridges that had spanned the Grand Canal at various times since the 12th Century. 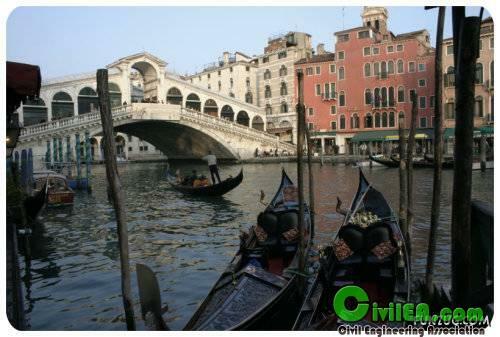 It remained the only way to cross the Grand Canal on foot until the Accademia Bridge was built in 1854. 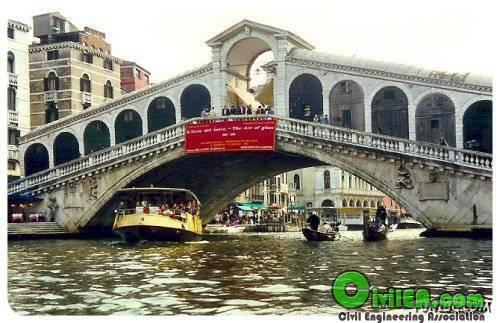 The Rialto Bridge's 24-foot arch was designed to allow passage of galleys, and the massive structure was built on some 12,000 wooden pilings that still support the bridge more than 400 years later. The architect, Antonio da Ponte ("Anthony of the Bridge," appropriately enough), competed against such eminent designers as Michelangelo and Palladio for the contract. 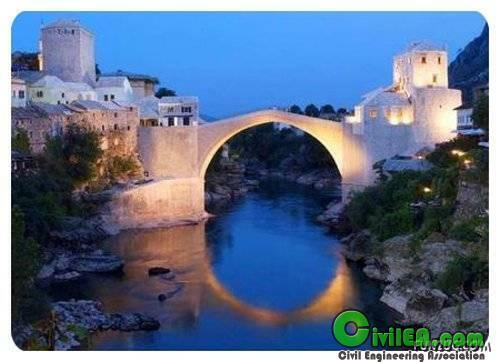 Stari Most (English translation: "The Old Bridge") is a 16th century Turkish bridge in the city of Mostar, Bosnia and Herzegovina that crosses the river Neretva and connects two parts of the city. The bridge was destroyed by Croatian Council of Defence units during the War in Bosnia-Herzegovina, on November 9, 1993 at 10.15 am. A project was set in motion to rebuild it, and the new bridge built by Turkish masters opened on July 23, 2004. 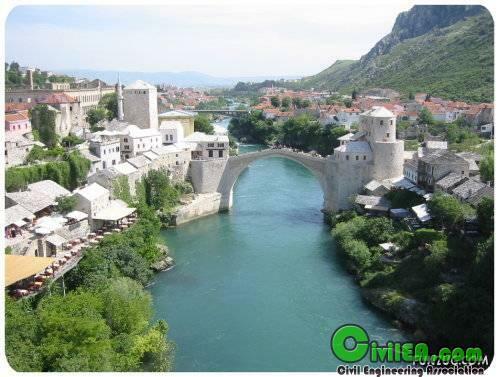 The bridge spans the Neretva river in the old town of Mostar, the city to which it gave the name. The city is the fourth-largest in the country, it is the center of the Herzegovina-Neretva Canton of the Federation, and the unofficial capital of Herzegovina. 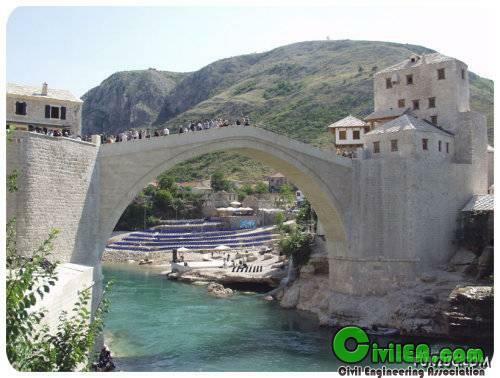 The Stari Most is hump-backed, 4 meters wide and 30 meters long, and dominates the river from a height of 24 meters. Two fortified towers protect it: the Helebija tower on the northeast and the Tara tower on the southwest, called "the bridge keepers" (natively mostari). The arch of the bridge was made of local stone known as tenelija. The shape of the arch is the result of numerous irregularities produced by the deformation of the intrados (the inner line of the arch). The most accurate description would be that it is a circle of which the centre is depressed in relation to the string course. Instead of foundations, the bridge has abutments of limestone linked to wing walls along the waterside cliffs. Measuring from the summer water level of 40.05 m, abutments are erected to a height of 6..53 m, from which the arch springs to its high point. The start of the arch is emphasized by a moulding 0.32 m. in height. The rise of the arch is 12.02 m.